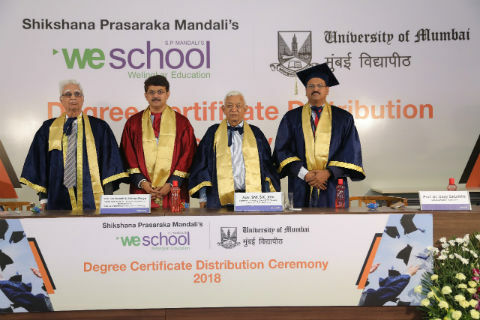 Mumbai: The convocation ceremony of graduating batches, MMS (Masters in Management Studies) and 3 Years Part-Time Master’s Degree Program in Marketing, Human Resources, Information Technology and Finance, S.P. Mandali’s Prin L. N. Welingkar Institute of Management Development and Research (WeSchool), Mumbai, was a lively event for students and parents to cherish. Mr. Shreekanth Arimanithaya, Senior Vice President, Integrated Workforce Management and India Co-Managing Director, DXC Technology India, the Chief Guest; Advocate Shri S. K. Jain, Chairman, Managing Council, S. P. Mandali and Local Managing Committee, WeSchool; Prof. Dr Uday Salunkhe, Group Director, WeSchool and Dr. S. R. Tendulkar, Dean, Administration, WeSchool shared their experience and words of wisdom to achieve success in career and personal life, with students. Principals of leading colleges, Dr. Dilip Sheth, Principal, S. P. College, Pune; Dr. Suhas Pednekar, Ramnarain Ruia College, Mumbai and Dr. Shobhana Vasudevan, Principal, R.A. Podar College of Commerce graced the occasion.